Tiger numbers worldwide have been falling due to loss of natural habitat and poaching. 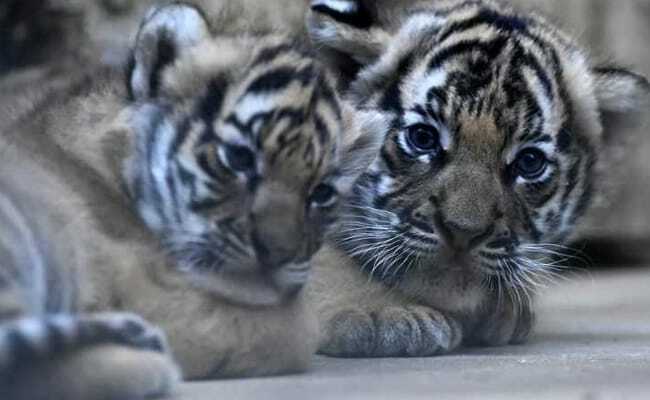 Prague, Czech Republic: The Prague zoo on Tuesday celebrated the health of two rare Malayan tiger cubs -- a male and a female -- born there six weeks ago. Zoo officials said that the small size of the female -- belonging to the critically endangered subspecies -- had been a cause for concern after two underweight cubs born this spring died. "We are monitoring their weight and development very closely," Pavel Brandl, the zoo's mammals curator, told AFP. 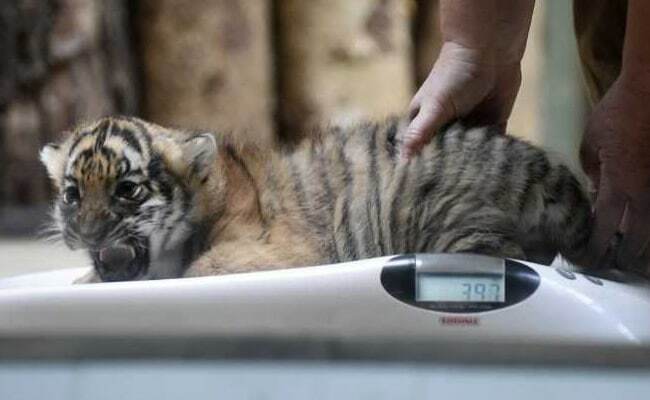 On Tuesday, the female weighed in at 3.78 kilos (8.3 pounds) on the scales, while the rambunctious male, who tried hard to escape the procedure, scored 5.16 kilos. "The male is developing very nicely, absolutely in line with veterinary data. The female was born small and she has to catch up. Her initial weight was too low," he added. The cubs, who have yet to be named by their breeders, were born to Banya and Johann, who have been a couple at Prague zoo for more than a year. "For Banya, it was literally her last chance to give birth. 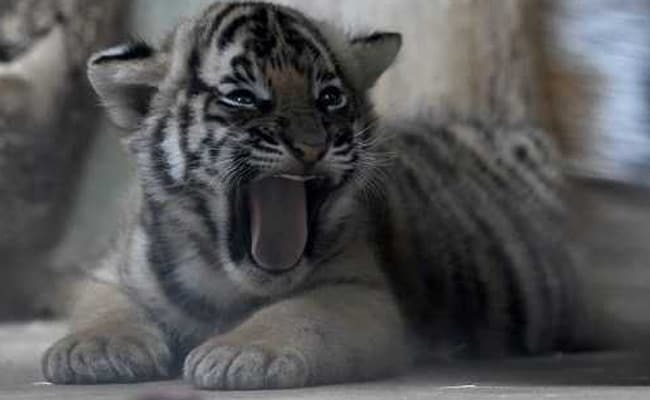 She's already 11 and tigresses very rarely give birth after 15 years of age," said Brandl. Banya gave birth to another set of cubs in the spring, but they did not survive because they were too small and Banya was an inexperienced mother. Only two other zoos in Europe -- including the one in Halle, Germany, in 2013 -- have successfully bred Malayan tigers to date. "The Malayan tiger is rather rare in European zoos, at present there are 17 adult animals," Brandl said. Brandl said that Banya's new set of cubs would be safer once they make it to their six-month birthday. They will be weaned at 18 months of age. "We still have a long way to go," he added. 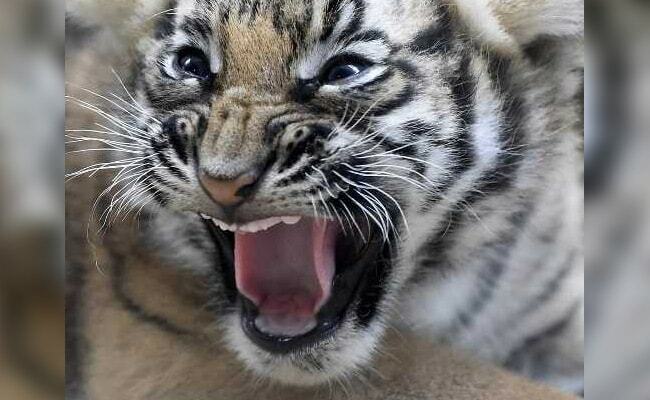 Tiger numbers worldwide have been falling due to loss of natural habitat and poaching. They are killed for their skins, with their body parts used in traditional Southern Asian medicine. "At present, some 3,000 tigers are left worldwide and there are only several hundred adult Malayan tigers," Brandl said. Breeding is also tricky because of the tigers' habits -- couples only stays together during the rutting period as tigers are solitary animals. "Besides, the males tend to be very aggressive, they attack the females - that's why it has taken us almost a decade to get a couple that is able to breed," Brandl told AFP.